Trans-3′-hydroxycotinine is a major metabolite of nicotine in humans and is mainly excreted as O-glucuronide in smoker's urine. Incubation of human liver microsomes with UDP-glucuronic acid produces not only trans-3′-hydroxycotinine O-glucuronide but also N-glucuronide. The formation of N-glucuronide exceeds the formation of O-glucuronide in most human liver microsomes, although N-glucuronide has never been detected in human urine. Trans-3′-hydroxycotinine N-glucuronidation in human liver microsomes was significantly correlated with nicotine and cotinine N-glucuronidations, which are catalyzed mainly by UDP-glucuronosyltransferase (UGT)1A4 and was inhibited by imipramine and nicotine, which are substrates of UGT1A4. Recombinant UGT1A4 exhibited substantial trans-3′-hydroxycotinine N-glucuronosyltransferase activity. These results suggest that trans-3′-hydroxycotinine N-glucuronidation in human liver microsomes would be mainly catalyzed by UGT1A4. In the present study, trans-3′-hydroxycotinine O-glucuronidation in human liver microsomes was thoroughly characterized, since trans-3′-hydroxycotinine O-glucuronide is one of the major metabolites of nicotine. The kinetics were fitted to the Michaelis-Menten equation with a Km of 10.0 ± 0.8 mM and a Vmax of 85.8 ± 3.8 pmol/min/mg. Among 11 recombinant human UGT isoforms expressed in baculovirus-infected insect cells, UGT2B7 exhibited the highest trans-3′-hydroxycotinine O-glucuronosyltransferase activity (1.1 pmol/min/mg) followed by UGT1A9 (0.3 pmol/min/mg), UGT2B15 (0.2 pmol/min/mg), and UGT2B4 (0.2 pmol/min/mg) at a substrate concentration of 1 mM. Trans-3′-hydroxycotinine O-glucuronosyltransferase activity by recombinant UGT2B7 increased with an increase in the substrate concentration up to 16 mM (10.5 pmol/min/mg). 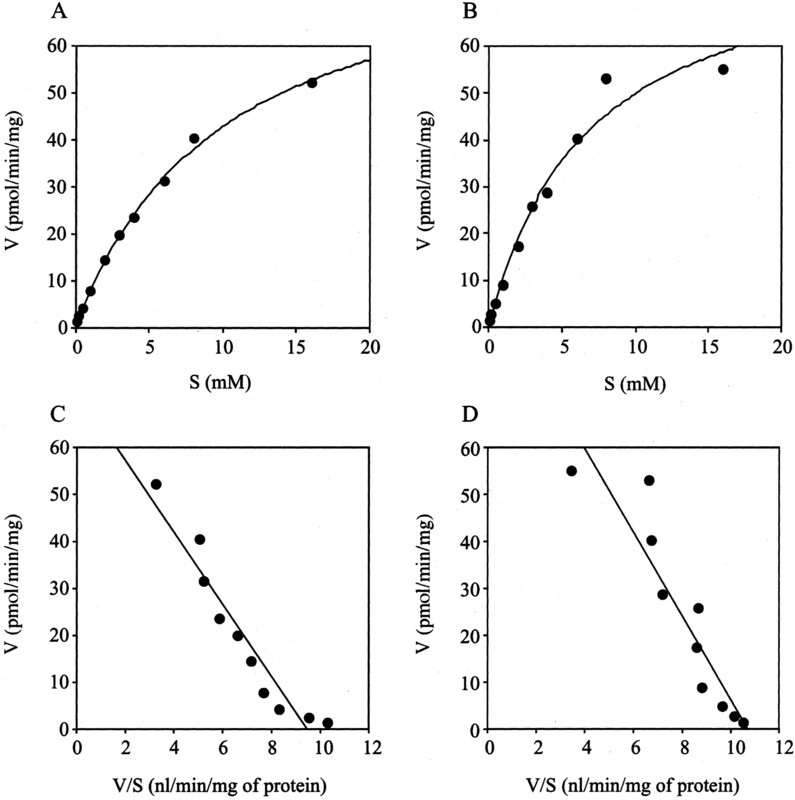 The kinetics by recombinant UGT1A9 were fitted to the Michaelis-Menten equation with Km = 1.6 ± 0.1 mM and Vmax = 0.69 ± 0.02 pmol/min/mg of protein. Trans-3′-hydroxycotinine O-glucuronosyltransferase activities in 13 human liver microsomes ranged from 2.4 to 12.6 pmol/min/mg and were significantly correlated with valproic acid glucuronidation (r = 0.716, p < 0.01), which is catalyzed by UGT2B7, UGT1A6, and UGT1A9. Trans-3′-hydroxycotinine O-glucuronosyltransferase activity in human liver microsomes was inhibited by imipramine (a substrate of UGT1A4, IC50 = 55 μM), androstanediol (a substrate of UGT2B15, IC50 = 169 μM), and propofol (a substrate of UGT1A9, IC50 = 296 μM). Interestingly, imipramine (IC50 = 45 μM), androstanediol (IC50 = 21 μM), and propofol (IC50 = 41 μM) also inhibited trans-3′-hydroxycotinine O-glucuronosyltransferase activity by recombinant UGT2B7. These findings suggested that trans-3′-hydroxycotinine O-glucuronidation in human liver microsomes is catalyzed by mainly UGT2B7 and, to a minor extent, by UGT1A9. Trans-3′-hydroxycotinine O-glucuronide is a major metabolite of nicotine in smoker's urine. Nicotine is metabolized to cotinine by CYP2A6 (Nakajima et al., 1996a), and cotinine is further metabolized to trans-3′-hydroxycotinine by CYP2A6 (Nakajima et al., 1996b). Glucuronide conjugates of nicotine, cotinine, and trans-3′-hydroxycotinine account for more than 40% of the nicotine dose (Byrd et al., 1992; Benowitz et al., 1994; Yamanaka et al., 2004). Nicotine and cotinine are metabolized to N-glucuronide (3-13 and 8-20% nicotine dose, respectively), whereas trans-3′-hydroxycotinine is metabolized to O-glucuronide (8-13% nicotine dose) in vivo. As far as we know, there is no information about the pharmacological activity of glucuronides of nicotine and its metabolites. However, it is emphasized that a first step of nicotine metabolism to cotinine extinguishes the pharmacological activity of nicotine. In general, glucuronidation is known as a detoxification pathway, since it enhances the elimination of compounds from the body. The theory would be true in glucuronidation of nicotine and its metabolites. Thus, glucuronidation is an important pathway of nicotine metabolism in humans. In our previous study, we clarified that nicotine and cotinine N-glucuronidation are catalyzed mainly by UGT1A4 (Nakajima et al., 2002b), a finding that was subsequently supported by Kuehl and Murphy (2003a). Recently, Kuehl and Murphy (2003b) detected N-linked glucuronide of trans-3′-hydroxycotinine by incubation with human liver microsomes. Nevertheless, the metabolite has never been detected in smoker's urine (Byrd et al., 1994). Since the trans-3′-hydroxycotinine N-glucuronidation was significantly correlated with nicotine and cotinine N-glucuronidations, Kuehl and Murphy (2003b) suggested that trans-3′-hydroxycotinine N-glucuronidation may be catalyzed by UGT1A4. Although trans-3′-hydroxycotinine O-glucuronide is the major glucuronide conjugate in smoker's urine, the UGT isoform(s) catalyzing the O-glucuronidation of trans-3′-hydroxycotinine has never been identified. In the present study, we characterized the trans-3′-hydroxycotinine O-glucuronidation in human liver microsomes and identified the human UGT isoform(s) involved in the glucuronidation compared with trans-3′-hydroxycotinine N-glucuronidation. Materials.Trans-3′-hydroxycotinine was kindly provided by Dr. William S. Caldwell (R. J. Reynolds Tobacco Company, Winston Salem, NC). Trans-3′-hydroxycotinine O- and N-glucuronides were purchased from Toronto Research Chemicals (Ontario, ON, Canada). UDP-glucuronic acid (UDPGA) and alamethicin were purchased from Sigma-Aldrich (St. Louis, MO). Valproic acid and imipramine hydrochloride were purchased from Wako Pure Chemicals (Osaka, Japan). Morphine hydrochloride was purchased from Takeda Chemical Industries (Osaka, Japan). Propofol was kindly supplied by AstraZeneca (London, UK). Pooled human liver microsomes (H161), microsomes from 13 individual human livers (H003, H006, H030, H043, H064, H066, H070, H089, H093, H095, H112, HK23, and HK34), and recombinant human UGT1A1, UGT1A3, UGT1A4, UGT1A6, UGT1A7, UGT1A8, UGT1A9, UGT1A10, UGT2B4, UGT2B7, and UGT2B15 expressed in baculovirus-infected insect cells (Supersomes) were purchased from BD Gentest (Woburn, MA). All other chemicals and solvents were of the highest grade commercially available. Trans-3′-Hydroxycotinine Glucuronidation Assay. A typical incubation mixture (100 μl of total volume) contained 20 mM Tris-HCl buffer (pH 7.4), 5 mM MgCl2, 2.5 mM UDPGA, 25 μg/ml alamethicin, 0.5 mg/ml human liver microsomes or recombinant UGTs, and 1 mM trans-3′-hydroxycotinine. The reactions were initiated by the addition of UDPGA and were then incubated at 37°C for 60 min. The reactions were terminated by 50 μl of methanol. After the centrifugation at 12,000 rpm for 5 min, the supernatant was filtered with a 0.22-μm filter (Ultrafree-MC centrifugal filter unit; Millipore GmbH, Eschborn, Germany). Aliquots of 5 μl were injected into the liquid chromatography (LC)-MS/MS system. LC-MS/MS Analysis for Trans-3′-Hydroxycotinine O- and N-Glucuronides. LC was performed using an HP1100 system including a binary pump, an automatic sampler, and a column oven (Agilent Technologies Deutschland GmbH, Waldbronn, Germany), which was equipped with a Mightysil RP-18 GP (4.6 × 150 mm; 5 μm) column (Kanto Chemical, Tokyo, Japan). The column temperature was 35°C. The mobile phase was 0.01% ammonia (A) and methanol (B). The conditions for elution were as follows: 0-10% B (0-1 min), 10-0% B (1-3 min), 0% B (3-6 min), 0-90% B (6-10 min), and 90-0% B (10-15 min). Linear gradients were used for all solvent changes. The flow rate was 0.5 ml/min. The LC was connected to a PE Sciex API2000 tandem mass spectrometer (Applied Biosystems, Langen, Germany) operated in the positive electrospray ionization mode. The turbo gas was maintained at 550°C. Nitrogen was used as the nebulizing, turbo, and curtain gas at 70, 90, and 50 psi, respectively. Parent and/or fragment ions were filtered in the first quadrupole and dissociated in the collision cell using nitrogen as the collision gas. The collision energy was 35 V and 25 V for trans-3′-hydroxycotinine and trans-3′-hydroxycotinine glucuronides, respectively. Two mass/charge (m/z) ion transitions were recorded in the multiple reaction monitoring mode: m/z 193 and 80 for trans-3′-hydroxycotinine; m/z 369 and 193 for trans-3′-hydroxycotinine glucuronide. The retention times of trans-3′-hydroxycotinine N-glucuronide, trans-3′-hydroxycotinine O-glucuronide, and trans-3′-hydroxycotinine were 3.4, 6.2, and 13.9 min, respectively. Kinetic Analyses of Trans-3′-Hydroxycotinine Glucuronidation in Human Liver Microsomes or Recombinant UGT2B7 and UGT1A9.Trans-3′-hydroxycotinine glucuronosyltransferase activities with substrate concentrations from 0.25 to 16 mM (to 4 mM for recombinant UGT1A9) were determined as described above. Kinetic parameters were estimated from the fitted curves using a KaleidaGraph computer program (Synergy Software, Reading, PA) designed for nonlinear regression analysis. Other Glucuronidation Assays. Nicotine and cotinine N-glucuronosyltransferase activities (Nakajima et al., 2002b) and imipramine N-glucuronosyltransferase activity (Nakajima et al., 2002a) in individual human liver microsomes were measured in our previous studies. Propofol and morphine glucuronosyltransferase activities in these human liver microsomes were provided by the manufacturer. Valproic acid glucuronosyltransferase activities in these human liver microsomes were determined in the present study. A typical incubation mixture (100 μl of total volume) contained 50 mM Tris-HCl buffer (pH 7.4), 10 mM MgCl2, 5 mM UDPGA, 25 μg/ml alamethicin, 0.25 mg/ml human liver microsomes, and 1 mM valproic acid. After a 1-min preincubation, the reactions were initiated by the addition of UDPGA and were incubated at 37°C for 30 min. The reactions were terminated by 50 μl of ice-cold methanol. After the centrifugation at 12,000 rpm for 5 min, the supernatant was filtered with a 0.22-μm filter (Ultrafree-MC centrifugal filter unit). Aliquots of 5 μl were injected into the LC-MS/MS system. The apparatus was the same as described above except for the column, a Cadenza CD-C18 (2.0 × 150 mm; 3 μm) column (Imtakt Corporation, Kyoto, Japan). The mobile phase was 0.01% ammonia (A) and methanol (B), and the conditions for elution were as follows: 0-70% B (0-7 min); 70-0% B (7-11 min). Linear gradients were used for all solvent changes. The flow rate was 0.2 ml/min, and the column temperature was 35°C. The MS/MS was operated in the negative electrospray ionization mode. The turbo gas was maintained at 550°C. Nitrogen was used as the nebulizing, turbo, and curtain gas at 60, 85, and 40 psi, respectively. The collision energy was -10 V and -20 V for valproic acid and valproic acid glucuronide, respectively. Mass/charge ion transitions were recorded in the multiple reaction monitoring mode: m/z 143 and 143 for valproic acid; m/z 319 and 143 for valproic acid glucuronide. The retention times of valproic acid and valproic acid glucuronide were 15.0 and 16.2 min, respectively. For the quantification of valproic acid glucuronide, the eluate of the LC from the incubation mixture with human liver microsomes, including valproic acid glucuronide, was collected referring to the retention time. A part of the eluate was incubated with 800 U/ml β-glucuronidase at 37°C for 24 h. Hydrolyzed valproic acid glucuronide was quantified as valproic acid by LC-MS/MS. Once we determined the peak area per known content of valproic acid glucuronide, the ratio was applied to the calculation of the valproic acid glucuronide formed in the incubation mixtures. Correlation Analyses. Correlation between trans-3′-hydroxycotinine O- and N-glucuronidations and the other glucuronosyltransferase activities were determined by Pearson's product-moment method. A p value of less than 0.05 was considered statistically significant. Inhibition Analyses of Trans-3′-Hydroxycotinine Glucuronidation in Human Liver Microsomes or Recombinant UGT2B7 and UGT1A9. Imipramine, a substrate for UGT1A4 (Nakajima et al., 2002a), propofol, a substrate for UGT1A9 (McGurk et al., 1998; Hanioka et al., 2001), morphine, a substrate for UGT2B7 (Coffman et al., 1997), androstanediol, a substrate for UGT2B15 (Turgeon et al., 2001), and nicotine and cotinine, substrates for UGT1A4 and UGT1A9 (Ghoshen and Hawes, 2002, Nakajima et al., 2002b, Kuehl and Murphy, 2003a) were tested for their inhibitory effects on trans-3′-hydroxycotinine O- and N-glucuronidations in pooled human liver microsomes. The effects of imipramine, propofol, morphine, and androstanediol on the trans-3′-hydroxycotinine O-glucuronidation by recombinant UGT2B7 and the effects of imipramine and propofol on the trans-3′-hydroxycotinine O-glucuronidation by recombinant UGT1A9 were also investigated. Trans-3′-Hydroxycotinine O- and N-Glucuronidations in Human Liver Microsomes. When the human liver microsomes were incubated with trans-3′-hydroxycotinine and UDPGA, trans-3′-hydroxycotinine O- and N-glucuronides were detected (Fig. 1). The formations of these glucuronides increased in microsomal protein concentration- and time-dependent manners. The formations were linear at least at 1 mg/ml microsomal protein and a 120-min incubation (data not shown). Unless specified, the standard incubation mixture containing 0.5 mg/ml microsomal protein and 2.5 mM UDPGA was incubated at 37°C for 60 min. In our preliminary study, the trans-3′-hydroxycotinine O- and N-glucuronidations in human microsomes were not changed at pH 7.4-8.6. The kinetics of trans-3′-hydroxycotinine O- and N-glucuronidations in pooled human liver microsomes were fitted to the Michaelis-Menten equation (Fig. 2, A and B). Eadie-Hofstee plots for both trans-3′-hydroxycotinine O- and N-glucuronidations were linear (Fig. 2, C and D). The apparent Km and Vmax values of trans-3′-hydroxycotinine O-glucuronidation in human liver microsomes were 10.0 ± 0.79 mM and 85.8 ± 3.8 pmol/min/mg of protein, respectively. The apparent Km and Vmax values of trans-3′-hydroxycotinine N-glucuronidation in human liver microsomes were 6.7 ± 1.5 mM and 83.4 ± 8.9 pmol/min/mg of protein, respectively. Representative chromatograms of LC-MS/MS analysis of trans-3′-hydroxycotinine glucuronidations in human liver microsomes. The incubation mixture including human liver microsomes and trans-3′-hydroxycotinine in the presence (A) or absence (B) of UDPGA. C, a mixture of authentic standards of trans-3′-hydroxycotinine O- and N-glucuronides (250 pg). Two m/z ion transitions were recorded in the multiple reaction monitoring mode: m/z 193 and 80 for trans-3′-hydroxycotinine (blue line); m/z 369 and 193 for trans-3′-hydroxycotinine glucuronide (red line). Michaelis-Menten plots (A, B) or Eadie-Hofstee plots (C, D) of trans-3′-hydroxycotinine O-glucuronidation (A, C) and N-glucuronidation (B, D) in human liver microsomes. Pooled human liver microsomes were incubated with 0.25 to 16 mM trans-3′-hydroxycotinine and 2.5 mM UDPGA at 37°C for 60 min. Each data point represents the mean of duplicate determinations. Trans-3′-Hydroxycotinine O- and N-Glucuronidations by Recombinant UGT Isoforms. Eleven recombinant UGT isoforms expressed in baculovirus-infected insect cells were used to determine their trans-3′-hydroxycotinine O- and N-glucuronosyltransferase activities. As shown in Fig. 3, UGT2B7 exhibited the highest trans-3′-hydroxycotinine O-glucuronosyltransferase activity (1.1 pmol/min/mg) followed by UGT1A9 (0.3 pmol/min/mg), UGT2B15 (0.2 pmol/min/mg), and UGT2B4 (0.2 pmol/min/mg); however, trans-3′-hydroxycotinine N-glucuronidation was detected only in recombinant UGT1A4 (0.5 pmol/min/mg). As shown in Fig. 4, trans-3′-hydroxycotinine O-glucuronosyltransferase activity by recombinant UGT2B7 increased with an increase in the concentration up to 16 mM (10.5 pmol/min/mg), whereas recombinant UGT1A9 reached a plateau with a Km value of 1.6 ± 0.1 mM. The Vmax value was 0.69 ± 0.02 pmol/min/mg of protein. Trans-3′-hydroxycotinine O-glucuronidation (A) and N-glucuronidation (B) in recombinant human UGT isoforms. Each recombinant UGT (0.5 mg/ml) was incubated with 1 mM trans-3′-hydroxycotinine and 2.5 mM UDPGA at 37°C for 60 min. Each column represents the mean of duplicate determinations. Kinetics of trans-3′-hydroxycotinine O-glucuronidation by recombinant UGT2B7 (A) and UGT1A9 (B). Recombinant UGT (0.5 mg/ml) was incubated with 0.25 to 16 mM (0.25-4 mM for UGT1A9) trans-3′-hydroxycotinine and 2.5 mM UDPGA at 37°C for 60 min. Each data point represents the mean of duplicate determinations. Interindividual Differences of Trans-3′-Hydroxycotinine O- and N-Glucuronidations in Human Liver Microsomes and Correlation Analyses.Trans-3′-hydroxycotinine O-glucuronosyltransferase activities in microsomes from 13 human livers ranged from 2.4 to 12.6 pmol/min/mg of protein, representing ∼5-fold variability (Fig. 5A). Trans-3′-hydroxycotinine N-glucuronosyltransferase activities in microsomes from 13 human livers ranged from 6.2 to 27.1 pmol/min/mg of protein, representing ∼4-fold variability (Fig. 5B). The ratio of N-glucuronide/O-glucuronide ranged from 1.0 to 4.8. Correlation analyses were performed between the trans-3′-hydroxycotinine O- or N-glucuronosyltransferase activity and imipramine (UGT1A4), propofol (UGT1A9), morphine (UGT2B7), nicotine (UGT1A4 and UGT1A9), cotinine (UGT1A4 and UGT1A9), or valproic acid (UGT2B7, UGT1A6, and UGT1A9) glucuronosyltransferase activities. Trans-3′-hydroxycotinine O-glucuronosyltransferase activities in 13 human liver microsomes were significantly (r = 0.716, p < 0.01) correlated with valproic acid glucuronosyltransferase activity (Table 1). Trans-3′-hydroxycotinine N-glucuronosyltransferase activity was significantly correlated with the nicotine (r = 0.918, p < 0.0001), cotinine (r = 0.852, p < 0.001), and morphine (r = 0.798, p < 0.05) glucuronosyltransferase activities. Interindividual variability in trans-3′-hydroxycotinine O-glucuronidation (A) and N-glucuronidation (B) in human liver microsomes. Liver microsomes from 13 humans (0.25 mg/ml) were incubated with 1 mM trans-3′-hydroxycotinine and 2.5 mM UDPGA at 37°C for 60 min. Each column represents the mean of duplicate determinations. Inhibitory Effects of Typical Substrates for UGT Isoforms on Trans-3′-Hydroxycotinine O- and N-Glucuronidation in HumanLiver Microsomes. The effects of imipramine (UGT1A4), propofol (UGT1A9), morphine (UGT2B7), androstanediol (UGT2B15), nicotine (UGT1A4, UGT1A9), and cotinine (UGT1A4, UGT1A9) on the trans-3′-hydroxycotinine O- and N-glucuronosyltransferase activities in pooled human liver microsomes were investigated. As shown in Fig. 6, the trans-3′-hydroxycotinine O-glucuronosyltransferase activity in the pooled human liver microsomes was weakly inhibited by imipramine (IC50 = 55 μM), androstanediol (IC50 = 169 μM), and propofol (IC50 = 296 μM). The trans-3′-hydroxycotinine N-glucuronosyltransferase activity was strongly inhibited by imipramine (IC50 = 21 μM) and propofol (IC50 = 20 μM) and weakly inhibited by nicotine (IC50 = 178 μM) and androstanediol (IC50 = 195 μM). Inhibitory effects of a variety of substrates for UGT isoforms on trans-3′-hydroxycotinine O-glucuronidation (A) and N-glucuronidation (B) in human liver microsomes. Trans-3′-hydroxycotinine O- and N-glucuronidations in pooled human liver microsomes were determined at a concentration of 1 mM trans-3′-hydroxycotinine in the presence of 1 to 500 μM UGT substrates. The control activities of the trans-3′-hydroxycotinine O- and N-glucuronidation were 7.7 and 8.9 pmol/min/mg, respectively. Each data point represents the mean of duplicate determinations. Effects of Typical Substrates for UGT Isoforms on Trans-3′-Hydroxycotinine O-Glucuronidation in Recombinant UGT2B7 and UGT1A9. To determine the UGT isoform selectivity of inhibition by compounds, we investigated the inhibitory effects on the trans-3′-hydroxycotinine O-glucuronidation in recombinant UGT isoforms. Trans-3′-hydroxycotinine O-glucuronosyltransferase activity in recombinant UGT2B7 was inhibited by androstanediol (IC50 = 21 μM), propofol (IC50 = 41 μM), and imipramine (IC50 = 45 μM) (Fig. 7A). The inhibitory effect of morphine was weak (IC50 = 374.2 μM). The trans-3′-hydroxycotinine O-glucuronosyltransferase activity in recombinant UGT1A9 was not affected by imipramine and morphine, whereas it was activated by propofol (2.2-fold with 500 μM) and androstanediol (2.7-fold with 500 μM) in a concentration-dependent manner (Fig. 7B). 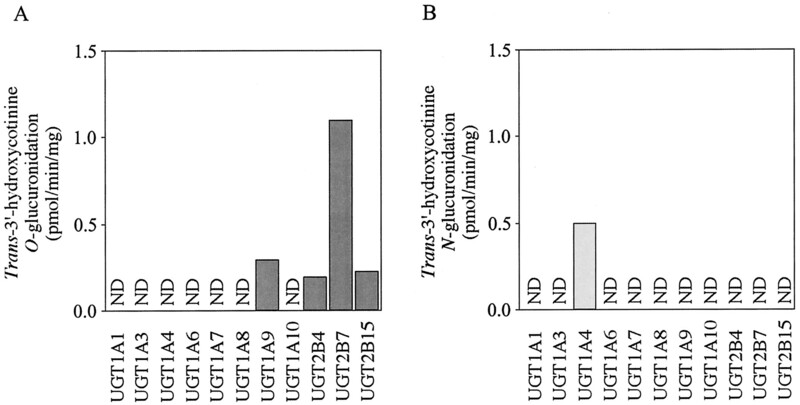 Inhibitory effects of a variety of substrates for UGT isoforms on trans-3′-hydroxycotinine O-glucuronidation by recombinant UGT2B7 (A) and UGT1A9 (B). Trans-3′-hydroxycotinine O-glucuronidations by recombinant UGT2B7 and UGT1A9 were determined at a concentration of 1 mM trans-3′-hydroxycotinine in the presence of 1 to 500 μM UGT substrates. The control activities by recombinant UGT2B7 and UGT1A9 were 1.1 and 0.3 pmol/min/mg, respectively. Each data point represents the mean of duplicate determinations. When the human liver microsomes were incubated with trans-3′-hydroxycotinine and UDPGA, not only O-glucuronide but also N-glucuronide were detected. The formation of N-glucuronide exceeded the formation of O-glucuronide in most human liver microsomes, being compatible with the previous report by Kuehl and Murphy (2003b). Trans-3′-hydroxycotinine N-glucuronidation in human liver microsomes was significantly correlated with nicotine and cotinine N-glucuronidations, which are catalyzed mainly by UGT1A4 (Table 1) and was inhibited by imipramine and nicotine, which are substrates of UGT1A4 (Fig. 6). Recombinant UGT1A4 exhibited substantial trans-3′-hydroxycotinine N-glucuronosyltransferase activity (Fig. 3). These results suggest that trans-3′-hydroxycotinine N-glucuronidation in human liver microsomes would be catalyzed by UGT1A4. In correlation analysis, trans-3′-hydroxycotinine N-glucuronidation in human liver microsomes was significantly correlated with morphine glucuronidation catalyzed by UGT2B7 (Table 1). 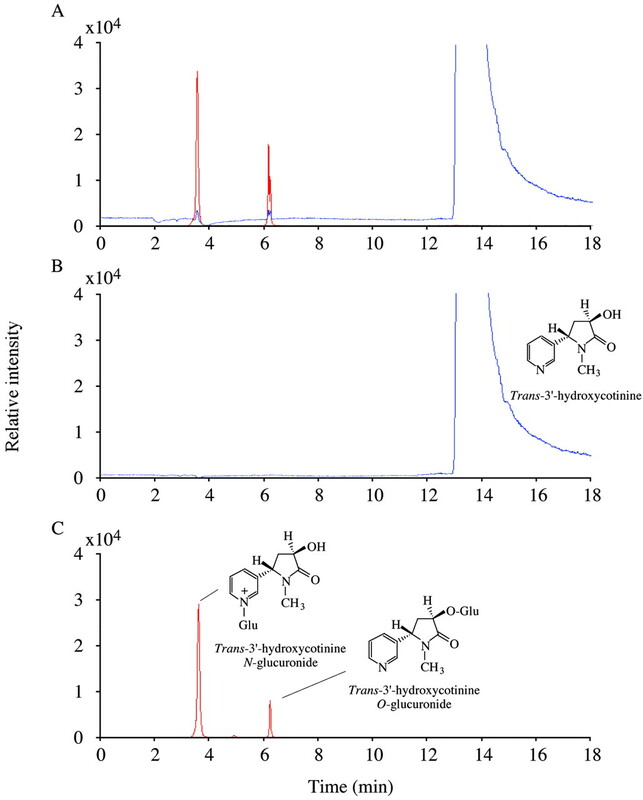 However, morphine glucuronidation was also significantly correlated with nicotine (r = 0.663, p < 0.05) and cotinine (r = 0.579, p < 0.05) glucuronidations catalyzed by UGT1A4 (data not shown). Therefore, the correlation with morphine glucuronidation might be a fortuitous result with the panel of human liver microsomes used in this study. In the inhibition study, trans-3′-hydroxycotinine N-glucuronidation in human liver microsomes was inhibited by nicotine, but not by cotinine, consistent with the evidence that the Km value of cotinine N-glucuronidation (1.9 ± 0.3 mM) was higher than that of nicotine N-glucuronidation (33.1 ± 28.1 μM) (Nakajima et al., 2002b). Since trans-3′-hydroxycotinine N-glucuronidation in human liver microsomes was also inhibited by propofol (in the present study) but propofol does not inhibit UGT1A4 activity (Kuehl and Murphy, 2003a), UGT1A9 might also be involved in trans-3′-hydroxycotinine N-glucuronidation in human liver microsomes, like nicotine and cotinine N-glucuronidations (Nakajima et al., 2002b; Kuehl and Murphy, 2003a). Trans-3′-hydroxycotinine N-glucuronide has not been detected in smoker's urine in vivo (Byrd et al., 1994). We also previously confirmed that trans-3′-hydroxycotinine N-glucuronide was not detected in smoker's urine or urine samples from nonsmokers who chewed nicotine gum by LC-MS/MS analysis (data not shown). For the contradiction between in vitro and in vivo, Kuehl and Murphy (2003b) discussed the possibility that the trans-3′-hydroxycotinine N-glucuronide is unstable relative to the trans-3′-hydroxycotinine O-glucuronide and trans-3′-hydroxycotinine N-glucuronide may be cleavaged prior to excretion, or alternatively, that other tissues may be the source of trans-3′-hydroxycotinine O-glucuronide formation. Thus, the reason for the contradiction between the in vitro and in vivo results has not been solved. Trans-3′-hydroxycotinine O-glucuronosyltransferase activities were detected with the recombinant UGT2B7, UGT1A9, UGT2B15, and UGT2B4. Trans-3′-hydroxycotinine O-glucuronidation in human liver microsomes was significantly correlated with valproic acid glucuronidation which is catalyzed by UGT2B7, UGT1A6, and UGT1A9 (Ethell et al., 2003). Trans-3′-hydroxycotinine O-glucuronidation in human liver microsomes was inhibited by imipramine (UGT1A4), propofol (UGT1A9), and androstanediol (UGT2B15). However, it was confirmed that these three compounds inhibited trans-3′-hydroxycotinine O-glucuronosyltransferase activity catalyzed by recombinant UGT2B7 with more potent inhibitory effects than those in human liver microsomes. In addition, we found that morphine 3-glucuronosyltransferase activity catalyzed by recombinant UGT2B7 (500 μM substrate concentration) was also inhibited by 22% with 500 μM imipramine, by 37% with 500 μM propofol, and by 26% with 500 μM androstanediol (data not shown). In contrast, imipramine and androstanediol did not affect trans-3′-hydroxycotinine O-glucuronosyltransferase activity catalyzed by recombinant UGT1A9. These results suggest that a major UGT isoform involved in trans-3′-hydroxycotinine O-glucuronidation in human liver microsomes would be UGT2B7. Although morphine glucuronidation is catalyzed by UGT2B7 (Coffman et al., 1997), the correlation with trans-3′-hydroxycotinine O-glucuronidation was not significant. It might be due to the contribution of other UGT isoforms such as UGT1A9 to the trans-3′-hydroxycotinine O-glucuronidation in human liver microsomes. Tobacco-specific nitrosamine, 4-(methylnitrosamino)-1-(3-pyridyl)-1-butanol, has been reported to be metabolized to its O-glucuronide by UGT1A9 and UGT2B7 (Ren et al., 2000) and its N-glucuronide by UGT1A4 (Wiener et al., 2004). Thus, the specificity of the UGT isoform for O- or N-glucuronidations of trans-3′-hydroxycotinine would be similar to that for 4-(methylnitrosamino)-1-(3-pyridyl)-1-butanol. Interestingly, trans-3′-hydroxycotinine O-glucuronidation by recombinant UGT1A9 was activated by propofol and androstanediol, although the activation was not observed with human liver microsomes. It has been reported that estradiol 3-glucuronidation in human liver microsomes was activated by 17α-ethynylestradiol (Williams et al., 2002). Recently, Mano et al. (2004) reported that β-estradiol and propofol activated 4-methylumbelliferone glucuronidation by recombinant UGT1A8 and UGT1A1, respectively. Thus, heterotropic effects of some compounds on the glucuronidation have been observed. It is noteworthy that propofol inhibited 4-methylumbelliferone glucuronidation by recombinant UGT1A9 (Mano et al., 2004). Therefore, the heterotropic effects of propofol on the UGT1A9 activity would depend on the substrates. Trans-3′-hydroxycotinine glucuronosyltransferase activities in recombinant UGTs were lower that those in human liver microsomes. Similar phenomenon has been observed in the glucuronidation of other compounds such as imipramine (Nakajima et al., 2002a), 2-hydroxyamino-1-methyl-6-phenylimidazo[4,5-b]pyridine (Nowell et al., 1999), and retigabine (Hiller et al., 1999). Furthermore, we previously found that recombinant UGT could not exhibit the detectable nicotine and cotinine N-glucuronidations, although human liver microsomes did show these activities (Nakajima et al., 2002b). Thus, the recombinant UGTs appear to have lower catalytic activities toward most substrates than human liver microsomes do. The fact might be partly due to the differences in the membrane circumstances in the expression system and in human liver microsomes. The present study demonstrated that the Km value of trans-3′-hydroxycotinine O-glucuronidation in human liver microsomes is high (ca. 10 mM), bringing up the question of the physiological significance of the reaction in vivo since blood trans-3′-hydroxycotinine concentrations are in the nanomolar range (Benowitz and Jacob, 2001). However, trans-3′-hydroxycotinine O-glucuronide is one of the major metabolites of nicotine in human urine. Generally, the Km values of the glucuronidation of various substrates are high in the millimolar range (Radominska-Pandya et al., 1999). Thus, the high Km value in vitro may suggest the possibility that in vitro experimental conditions with human liver microsomes do not reflect the activity in vivo. For drugs that are cleared predominantly through cytochrome P450-mediated metabolism, there is growing evidence that successful prediction of in vivo metabolic clearance from in vitro metabolic data can be accomplished (Iwatsubo et al., 1997). In contrast, metabolic clearance of drugs that are substantially cleared through glucuronidation appears to be less well predicted using in vitro metabolic data (Lin and Wong, 2002). It has been suggested that the latency of UGT was the main reason for the underprediction of in vivo metabolic clearance. In addition, the transport of UDPGA, removal of formed glucuronide from microsomes, the phenomena of dimerization of UGT, and glucuronide hydrolysis have been also suggested to contribute to the underprediction (Lin and Wong, 2002). In conclusion, we thoroughly characterized the trans-3′-hydroxycotinine O- and N-glucuronidations in human liver microsomes. This is the first study to show that trans-3′-hydroxycotinine O-glucuronidation in human liver microsomes is catalyzed mainly by UGT2B7 and, to a minor extent, by UGT1A9. We acknowledge Mr. Brent Bell for reviewing the manuscript. This study was supported by an SRF grant for Biomedical Research in Japan and by Philip Morris Incorporated. ABBREVIATIONS: UGT, UDP-glucuronosyltransferase; UDPGA, UDP-glucuronic acid; LC-MS/MS, liquid chromatography-mass/mass spectrometry; m/z, mass/charge. Benowitz NL and Jacob P III (2001) Trans-3′-hydroxycotinine: disposition kinetics, effects and plasma levels during cigarette smoking. Br J Clin Pharmacol 51: 53-59. Benowitz NL, Jacob P III, Fong I, and Gupta S (1994) Nicotine metabolic profile in man: comparison of cigarette smoking and transdermal nicotine. J Pharmacol Exp Ther 268: 296-303. Byrd GD, Chang KM, Greene JM, and deBethizy JD (1992) Evidence for urinary excretion of glucuronide conjugates of nicotine, cotinine and trans-3′-hydroxycotinine in smokers. Drug Metab Dispos 20: 192-197. Byrd GD, Uhrig MS, deBethizy JD, Caldwell WS, Crooks PA, Ravard A, and Riggs R (1994) Direct determination of cotinine-N-glucuronide in urine using thermospray liquid chromatography/mass spectrometry. Biol Mass Spectrom 23: 103-107. Coffman BL, Rios GR, King CD, and Tephly TR (1997) Human UGT2B7 catalyzes morphine glucuronidation. Drug Metab Dispos 25: 1-4. Ethell BT, Anderson GD, and Burchell B (2003) The effect of valproic acid on drug and steroid glucuronidation by expressed human UDP-glucuronosyltransferases. Biochem Pharmacol 65: 1441-1449. Ghoshen O and Hawes EM (2002) N-glucuronidation of nicotine and cotinine in human: formation of cotinine glucuronide in liver microsomes and lack of catalysis by 10 examined UDP-glucuronosyltransferases. Drug Metab Dispos 30: 991-996. Hanioka N, Ozawa S, Jinno H, Ando M, Saito Y, and Sawada J (2001) Human liver UDP-glucuronosyltransferase isoforms involved in the glucuronidation of 7-ethyl-10-hydroxycamptothecin. Xenobiotica 31: 687-699. Hiller A, Nghia N, Strassburg CP, Li Q, Jainta H, Pechstein B, Ruus P, Engel J, Tuley RH, and Kronbach T (1999) Retigabine N-glucuronidation and its potential role in enterohepatic circulation. Drug Metab Dispos 27: 605-612. Iwatsubo T, Hirota N, Ooie T, Suzuki H, Shimada N, Chiba K, Ishizaki T, Green CE, Tyson CA, and Sugiyama Y (1997) Prediction of in vivo drug metabolism in the human liver from in vitro metabolism data. Pharmacol Ther 73: 147-171. Kuehl GE and Murphy SE (2003a) N-glucuronidation of nicotine and cotinine by human liver microsomes and heterologously expressed UDP-glucuronosyltransferases. Drug Metab Dispos 31: 1361-1368. Kuehl GE and Murphy SE (2003b) N-glucuronidation of trans-3′-hydroxycotinine by human liver microsomes. Chem Res Toxicol 16: 1502-1506. Lin JH and Wong BK (2002) Complexities of glucuronidation affecting in vitro-in vivo extrapolation. Curr Drug Metab 3: 623-646. Mano Y, Usui T, and Kamimura H (2004) In vitro inhibition and stimulation of β-estradiol and propofol on the 4-methylumbelliferone glucuronidation by recombinant human UGT isozymes 1A1, 1A8 and 1A9. Biopharm Drug Dispos 25: 339-344. McGurk KA, Brierley CH, and Burchell B (1998) Drug glucuronidation by human renal UDP-glucuronosyltransferases. Biochem Pharmacol 55: 1005-1012. Nakajima M, Tanaka E, Kobayashi T, Ohashi N, Kume T, and Yokoi T (2002a) Imipramine N-glucuronidations in human liver microsomes: biphasic kinetics and characterization of UDP-glucuronosyltransferase isoforms. Drug Metab Dispos 30: 636-642. Nakajima M, Tanaka E, Kwon JT, and Yokoi T (2002b) Characterization of nicotine and cotinine N-glucuronidations in human liver microsomes. Drug Metab Dispos 30: 1484-1490. Nakajima M, Yamamoto T, Nunoya K-I, Yokoi T, Nagashima K, Inoue K, Funae Y, Shimada N, Kamataki T, and Kuroiwa Y (1996a) Role of human cytochrome P450 2A6 in C-oxidation of nicotine. Drug Metab Dispos 24: 1212-1217. Nakajima M, Yamamoto T, Nunoya K-I, Yokoi T, Nagashima K, Inoue K, Funae Y, Shimada N, Kamataki T, and Kuroiwa Y (1996b) Characterization of CYP2A6 involved in 3′-hydroxylation of cotinine in human liver microsomes. J Pharmacol Exp Ther 277: 1010-1015. Nowell SA, Massengill JS, Williams S, Radominska-Pandya A, Tephly TR, Cheng Z, Strassburg CP, Tukey RH, MacLeod SL, Lang NP, et al. (1999) Glucuronidation of 2-hydroxyamino-1-methyl-6-phenylimidazo[4,5-b]pyridine by human microsomal UDP-glucuronosyltransferases: identification of specific UGT1A family isoforms involved. Carcinogenesis 20: 1107-1114. Radominska-Pandya A, Czernik PJ, and Little JM (1999) Structural and functional studies of UDP-glucuronosyltransferases. Drug Metab Rev 31: 817-899. Ren Q, Murphy SE, and Lazarus P (2000) O-Glucuronidation of the lung carcinogen 4-(methylnitrosamino)-1-(3-pyridyl)-1-butanol (NNAL) by human UDP-glucuronosyltransferases 2B7 and 1A9. Drug Metab Dispos 28: 1352-1360. Turgeon D, Carrier JS, Levesque E, Hum DW, and Belanger A (2001) Relative enzymatic activity, protein stability and tissue distribution of human steroid-metabolizing UGT2B subfamily members. Endocrinology 142: 778-787. Wiener D, Doerge DR, Fang J-L, Upadhyaya P, and Lazarus P (2004) Characterization of N-glucuronidation of the lung carcinogen 4-(methylnitrosamino)-1-(3-pyridyl)-1-butanol (NNAL) in human liver: importance of UDP-glucuronosyltransferase 1A4. Drug Metab Dispos 32: 72-79. Williams JA, Ring BJ, Cantrell VE, Campanale K, Jones DR, Hall SD, and Wrighton SA (2002) Differential modulation of UDP-glucuronosyltransferase 1A1 (UGT1A1)-catalyzed estradiol-3-glucuronidation by the addition of UGT1A1 substrates and other compounds to human liver microsomes. Drug Metab Dispos 30: 1266-1273. Yamanaka H, Nakajima M, Nishimura K, Yoshida R, Fukami T, Katoh M, and Yokoi T (2004) Metabolic profile of nicotine in subjects whose CYP2A6 gene is deleted. Eur J Pharm Sci 22: 419-425.